Israel Pierce has one of the most heart-breaking stories of region soldiers who served in the Civil War. Though he survived the war, Pierce&apos;s life was largely defined by tragedy. Twenty years after his service in the 99th Indiana ended, Pierce, a Merrillville farmer, hanged himself in a stable on his property. He suffered from arthritis and other ailments following the war and spent nearly two decades unsuccessfully petitioning the government for a soldier&apos;s disability pension. His cemetery marker also carries the names of his wife, Mary C. Pierce, who died in 1915 at the age of 74, and an infant child, Major, who died in March 1862, four months before Pierce joined the 99th Indiana Infantry. His headstone carries an inscription in which his wife laments the loss of her "dearest husband." James D. Merrill was the son of Dudley Merrill, one of the founding fathers of Merrillville. He died at the Battle of the Wilderness, a two-day engagement in 1864 that proved to be one of the war&apos;s bloodiest engagements. The dead and wounded totaled about 30,000 men in a battle of attrition that was won by neither side. James&apos; father Dudley is buried just a short distance from the war hero. A passage about Merrill in historian Craig L. Dunn&apos;s book, "Harvestfields of Death: The Twentieth Indiana Volunteers of Gettysburg," shows just how close men from the Union Army came to their Confederate enemies, both in proximity and interaction, beyond the fighting. In May, 1863, Merrill&apos;s regiment was camped in the stifling heat along the Rappahannock River in Virginia. To escape the heat, both Union and Confederate men would refresh themselves at the river&apos;s bank, often carrying on conversations in the process. At some point, Merrill and two other 20th Indiana privates crossed the river and dined with a group of Confederate soldiers while on picket duty. Merrill&apos;s brother, Lt. John Merrill, also served in the Civil War, with Company A of the 99th Indiana Infantry. John Merrill is buried in Crown Point&apos;s Historic Maplewood Cemetery. 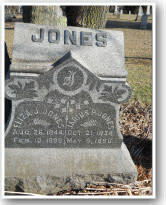 With the 20th Indiana Infantry, Jones fought in some of the bloodiest campaigns of the Civil War. His regiment fought in the Battle of Bull Run in 1862, the Battle of Chancellorsville in 1863, the Battle of Gettysburg in 1863 and the Battle of the Wilderness in 1864. The 20th Indiana Infantry -- famously led by Crown Point&apos;s Col. John Wheeler until the colonel&apos;s death at Gettysburg -- also was present at Appomattox Court House, the site of Confederate Gen. Robert E. Lee&apos;s surrender of the Confederate Army. The surrender effectively ended the Civil War. 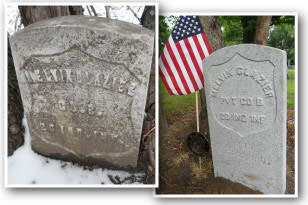 Glazier is the lone Civil War veteran at Merrillville Cemetery to receive a new granite headstone in 2011 through the efforts of the Calumet Region Civil War Preservation Project. Though replacements also were thought for several other headstones at the cemetery, those original markers were deemed to be in acceptable condition by the U.S. Department of Veterans Affairs. Glazier was recruited to fight in Company B in February 1862, likely to help replenish casualties lost during the war&apos;s first year. Glazier survived the war, dying of a reported heart attack in a Hammond jury room in 1902. Knoll, a native of Canada, was 11 when he moved to Ross Township with his father, a farmer. Knoll worked as a farmer until 1864, when he enlisted with Company K. He suffered gunshot wounds to his right arm and left leg during fighting in Tennessee, and at least one bullet reportedly remained in his body for the rest of his life. Described in historical writings as a "liberal Democrat," Knoll returned to farming in Lake County following the war. Underwood reportedly owned a farm a few miles east of Merrillville before his death. He also served as a Lake County commissioner in 1858, at which time he reportedly prevented a loss of territory from Lake County. Historical works of the 99th Indiana Infantry describe Ragen as a "true comrade" and a "good soldier." 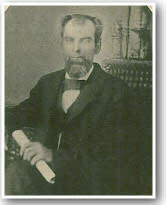 Born in Ohio, Ragen came to Indiana with his family in 1844. Undine&apos;s Ohio regiment participated in the Battle of Chickamauga, in which more than 34,000 men were either killed or wounded. 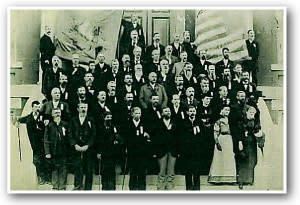 After returning home from the war, Undine joined the post-war organization Grand Army of the Republic, or G.A.R., similar to today&apos;s American Legion or Veterans of Foreign Wars organizations. In addition to the fellow soldiers Barton saw die in the war, his young son died at home while he was away fighting. His account, published in the Lake County Historical Association&apos;s "History of Lake County," indicated he was elected Ross Township assessor in 1865 -- the year the Civil War ended. A carpenter by trade, Barton also worked as a traveling salesman for a Michigan-based medicine company later in his career. Vanness fought for the hard-fighting 20th Indiana Infantry, originally enlisting with Company B. The company was raised through the resources and influence of Crown Point&apos;s John Wheeler, who eventually became commanding officer for the entire regiment. James Frazier served in the same company organized by Crown Point native Col. John Wheeler, the namesake of one of Crown Point&apos;s middle schools. Frazier survived the war, but Wheeler was not so lucky. The colonel died on the battlefield at Gettysburg, Penn. James Frazier is buried with his wife Mary in Merrillville. Huntley survived the war and returned to Ross Township, where he reportedly lived for many years before moving to the south side of Chicago. At the age of 60, Huntley died in a fire at a building he owned on Chicago&apos;s Houston Avenue. Old newspaper clippings indicate White was born in England in 1825 and moved to the United States in 1840. Eight members of Company A reportedly acted as pallbearers at his Merrillville funeral. Zuvers, a farmer, reportedly owned the second-oldest home in Merrillville during his era in the town. Local historical sources indicate Zuvers often trapped, traded and lived among Native American tribes. Levi and his twin brother Eli were innovative, successful farmers in Merrillville. They introduced Holstein cattle to Lake County. Brother Eli maintained the home front while Levi left for war. He was wounded July 28, 1864, but he continued to serve until the end of the war, when he returned home June 16, 1865.Levi died at age 82 from a paralytic stoke. 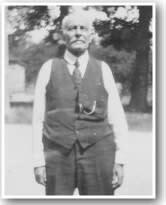 Benjamin Case was one of the oldest settlers in the area when he passed away on a Sunday morning in 1918. Conditions in LaGrange, Tennessee were so harsh, over 50 men died of typhoid fever, including Hiram Case. The Illinois Civil War Muster & Descriptive Rolls described August Niksch as a native of Prussia who was 39 years old at the time of his enrollment on February 22, 1865. His personal characteristics are listed as 5&apos;6" tall, brown hair, gray eyes with a dark complexion. His occupation was listed as shoemaker. He was mustered out on September 20, 1865 in Memphis, Tennessee. Clarence Pierce&apos;s enrollment card lists his birth place as Porter, Indiana. His occupation was that of a student. He was 18 when he enrolled in 1862. He was discharged in 1864 due to chronic diarrhea which ultimately ended his young life. Corydon Pierce was the eldest of the three Pierce brothers who served in Co. A of the 99th Indiana Infantry. Family records indicate that Corydon was captured on July 22, 1864 and was imprisoned at the notorious Andersonville, Georgia Confederate prison. Before the camp was liberated, he along with other many other prisoners were moved. However, he was so ill that he died before he could receive medical treatment. Although he was buried at Oakdale National Cemetery in Wilmington, North Carolina, the family erected a stone in the family plot that included his information as well as that of a baby daughter. "Death of Corydon Pierce—By request of Mrs. Pierce we publish below the letter informing her of the death, by starvation, of her son—one of the victims of Wilmington.—Young Pierce enlisted as a private in Company A, 99th Indiana Regiment upon its organization, served with it until the battles before Atlanta, when he was reported among the missing, and supposed to have been killed. He was killed, but not in the manner soldiers wish to die. Dear Madam:--I have the unpleasant duty to inform you of the death of your son, Corydon P. Pierce, of Co. A, 99th Reg. Ind. Vols. He died on the 7th day of March, soon after his arrival here. His body is interred in Oakdale Cemetery; a head and foot board is put up on his grave, and all is done that can be for the "poor soldier." I saw the poor starved, sick and heart sick soldiers when they came in to this place—and everything was done that could be for them, but life we cannot save, and I trust they have gone to a better world, where all is joy and peace. It is our duty to be prepared to go at any time, and also to think that our troubles and trials in this world are for our good. B. F. Woodruff, Clerk Med. Dir. Office." Marion F. Pierce, along with older brother Corydon and younger brother Myiel, left Merrillville in 1862 to serve their country in the 99th Indiana Volunteer Infantry. The 99th took part in many major battles, including Vicksburg, Jackson, Resaca, Lookout Mountain, Atlanta, Jonesboro, Fort McAllister, as well as marching with General Sherman&apos;s campaign to the sea, and on to Washington, where he participated in the Grand Review. When Pierce returned to Ross Township he resumed farm work and later was a very well-known business and community leader. He was trustee of Ross township for nine years, served as postmaster of Merrillville four years, and was in the Internal Revenue Service five years under Cleveland&apos;s administration. Myiel was the youngest of the Pierce brothers to serve Co. A of the 99th Regiment of the Indiana Volunteers. After the War he was an upstanding and highly respected member of the community. In addition to farming, Myiel Pierce, Jr. was Merrillville Methodist Church Sunday School superintendent from 1880 until 1888. He was the last Civil War veterans buried at the Merrillville Cemetery. Sawyer was transferred to the Veterans Reserve Corps (VRC) on September 1, 1863 as a result of a disability. His rank was changed to Private after the transfer. Details of his death are unknown. 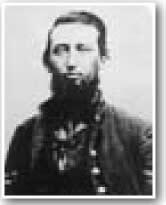 Daniel Sawyer was the first captain of Company A of the 99th Indiana Infantry. Prior to the War he had been a Lake County commissioner. He was described as a "beloved" captain who died of disease early in early 1863 during the Campaign in Mississippi. His family brought his body home to Merrillville to be interred. 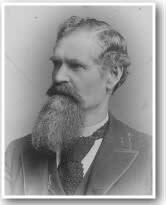 Born in Vermont, Ebenezer Saxton came to Merrillville, Indiana in 1837 when he was 12 years old with his parents Minerva and Ebenezer Saxton, one of the first pioneer families to settle in Merrillville. 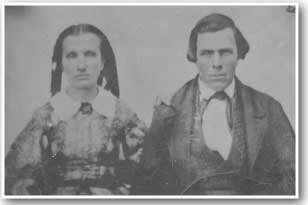 Pictured with his wife Mary Ann Mummery, like many others from Lake County, Saxton enlisted in a Cook County, Illinois regiment. The Illinois Muster & Descriptive Roll describes Ebenezer as a farmer who was 40 years of age, 5&apos;4" tall, with dark complexion, brown hair and blue eyes. He died of illness in Louisville, Kentucky as the regiment returned home after the war ended. Saxton&apos;s remains are buried there in the Cave Hill National Cemetery, Louisville, Kentucky. His family honored his memory with a tombstone in the Merrillville Cemetery that includes his name and service. John Steichelman was wounded died September 23, 1864 of wounds received in Atlanta, Georgia. His grave is located in the National Cemetery in Marietta, Georgia. His family honored him with a family headstone. Field Hospital, 15th A C Marietta, Ga. Respected Madam:--Since it has become my painful duty to break to you the sad intelligence of the death of your husband, I will do so. John Steichelman was wounded "near Atlanta," in the head, while bravely battling for the cause of his and our common country. He was sent to this hospital and became an occupant of my ward, where every effort was used to make his condition as comfortable as possible, but it availed nothing. He suffered greatly, but bore it with heroic fortitude. He often talked about you and his little ones and expressed a desire to see you once more; but such was not to be his lot. God, the All-wise, had numbered his days and ended his sufferings. When death drew near he said that he was ready to die, that he believed in the efficacy of the atoning blood of our blessed Savior, and as he was not permitted to see you any more on earth he seemed to be sure that he would meet you in Heaven, that blessed abode, where there is no more war, sickness and suffering, but where there is everlasting life and rejoicing. To that blessed bright and happy land his spirit (went) on the morning of the 23rd inst. It is beyond a doubt a hard blow to you, Madam, and your children who put your trust in Him who has promised to be a father and protect the widow and orphan. He will not forsake you in the hour of trial Console yourself with the thought and knowledge that he died in the cause of our Union, and that he died a Christian. May God protect and comfort you in your deep sorrow, is my prayer. T.P. Keys, Wardmaster, Co. I, 100th Ind Regiment." 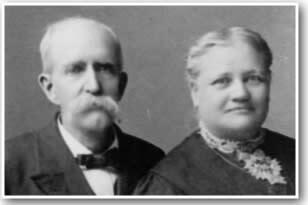 After the War, Seymour Wayman (pictured with wife Huldah Green Wayman) moved to Merrillville, married, became a faithful member of the Merrillville Methodist Church serving as Superintendent of the Sunday school from 1888-1889. He also served as postmaster and justice of the peace for Merrillville. Amos Zuvers was discharged from the 99th Regiment on April 16, 1863; Memphis, Tennessee. No reason for discharge was listed in the regimental history. Charles Zuvers joined Company B of the 20th Indiana in June, 1861 and was honorably discharged in December of that year as a result of illness. He came home but died at home a few months later.